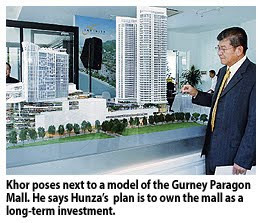 HUNZA Properties Bhd (HPB) plans to attract an international retailer to be an anchor tenant at its RM400 million Gurney Paragon shopping mall in Penang, which is slated to open in two years. Its executive chairman Datuk Khor Teng Tong said apart from creating between 3,000 and 4,000 new jobs in Penang when the mall opens, plans are in place to bring in new names to the state's retail scene. "These will be old and well-loved international brands, which are not yet in Penang but already in Kuala Lumpur," he told Business Times. The eight-storey mall is one component of Hunza's Gurney Paragon development, which is located in George Town where the historical and sea-fronting St Joseph's Novitiate was once located . The 84 year-old French style building, which served as a novitiate for the Christian brothers and sits on a 4.08ha freehold site, was purchased by HPB from the Federation of Malaya of the Christian Brothers' Schools for RM97 million. Apart from the shopping mall, an office block and 220 units of high-end condominiums form part of the development as well. With a gross built-up area of 2 million sq ft, the mall will have a net lettable area of 700,000 sq ft and is expected to fetch a rental rate of around RM6.50 per sq ft. Asked if the mall is up for sale, Khor said: "Our plan is to own the mall as a long-term investment." He also did not discount the possibility of a real estate investment trust for the mall later as an option. On HPB's proposed "Alila 2" project in Tanjung Bungah, Khor said the RM250 million high-end residential project is looking to obtain the Green Building Index certification. Naza Group, Malaysia’s biggest luxury vehicle importer, has lined up RM6.4 billion (US$1.9 billion) of property projects this year and is in talks for its first overseas real estate foray in China. The company, which was picked by Peugeot Automobiles this month to lead its expansion in Southeast Asia, is counting on an economic recovery to draw local and foreign investors to its real estate projects as it aims to more than double its property unit’s revenue to RM2 billion in five years. It has longer-term plans for a property trust and is lining up investors for a proposed a 100-floor tower in Kuala Lumpur. “It’s going to be a better year,” said Naza’s 27-year-old joint chief executive officer S.M. Nasarudin S.M. Nasimuddin who has been helping run the unlisted company for the past two years after his father passed away. “I expect the property market to pick up,” he said in an interview in Kuala Lumpur. Nasarudin and his brothers Faisal and Faliq, are sons of the late Nasimuddin Amin, the group’s founder. Nasimuddin began selling luxury cars in Malaysia when he was 21 and built Naza into one of the nation’s biggest auto groups after securing the rights to assemble Kia Motors Corp. vehicles in Malaysia. He died of cancer in May 2008 at 53. Naza, which Nasimuddin founded in 1974, expanded into transport, property, hotel and the food and beverage industry. Its real estate business today accounts for 30 per cent of group sales, its second-biggest contributor. Among its seven projects planned for this year is the RM4 billion Platinum Park project at the Kuala Lumpur City Centre, comprising three office towers, three residential towers and a hotel. Naza, which sells Ferrari and Maserati cars and Ducati motorbikes, is also lining up foreign investors for Kuala Lumpur’s biggest property project, Nasarudin said. It won land rights in November from the government to construct an exhibition center, on top of which it may build a 100-floor tower as part of a 15 billion ringgit, 15-year project. That’s potentially higher than Kuala Lumpur’s 88-floor Petronas Twin Towers, previously the world’s tallest building before being surpassed by Taipei 101. “The idea is that we would like to attract foreign investors to come in,” Nasarudin said. “It brings significant value to the development overseas.” The master-plan for the project will be ready next month, he said. Naza is seeking property deals in China, Singapore and the US to rely less on its home market, Nasarudin said. It may conclude an agreement for a residential and commercial deal in China this year, he said, without giving details. The company expects its property unit to contribute about 40 per cent of sales in five years time, up from the current 30 per cent, said Nasarudin. Naza’s automotive business will remain the dominant income earner, Nasarudin said, adding he expects to sell 22,000 Kia cars in Malaysia this year, up 87 per cent from 2009, he said. Putrajaya will have a new business class hotel by mid-2012 on a 1.5-ha land adjacent to Alamanda Shopping Centre. Putrajaya Holdings Sdn Bhd's Project Management Division General Manager Hassan Ramadi said the 16-storey hotel would have 382 rooms and cost about RM147 million. It would not be seen as a competition to Pullman Putrajaya Lakeside, but a complement instead, he told reporters after the topping up ceremony for Putrajaya's tallest buildings constructed by Sunway Construction Sdn Bhd (SunCon). He said the hotel be around three to four star and offer rates starting from RM150 per room per night. "The problem here is there are too many officers. What we hope from this project is it will create vibrancy in Putrajaya," he said. Hassan said the hotel operator had not been decided but the construction work had been awarded to SunCon and it would begin in February. Today's ceremony was to mark the completion of structural works of the buildings on Lot 4G10 and Lot 4G11 in Presint 4. The 40 and 41-storey buildings, allocated for the Housing and Local Government Ministry and the Women, Family and Community Development Ministry, are expected to be fully completed by the middle of next year. Present at the ceremony were Sunway Group Founder and Chairman Tan Sri Dr Jeffrey Cheah, SunCon Senior Managing Director Datuk Tan Kia Loke, SunCon Managing Director Kwan Foh Kwai and Putrajaya Holdings Sdn Bhd Chief Executive Officer Datuk Azlan Abdul Karim. Axis REIT Managers Bhd, the manager of Axis Real Estate Investment Trust (REIT), targets to manage RM1 billion worth of assets by the end of this year. It plans to buy five properties, valued at about RM180 million, this year. It is now assessing two new warehouses in Port of Tanjung Pelepas in Johor, a factory or a warehouse in Puchong, Selangor, and an office building in Cyberjaya. "We are targeting another capital raising in early 2010," said chief executive officer Stewart LaBrooy during a media briefing yesterday. Axis REIT plans to place out another 61.4 million units or about 20 per cent of its current fund size, which will raise some RM113 million. As at December 31 2009, it managed 21 properties ranging from offices and warehouses to logistic centres, with a total asset value of RM907.74 million. For 2009, Axis REIT's revenue rose 13.4 per cent to RM71.9 million, while net income stood at RM42.9 million against RM39 million in 2008. It has borrowings of RM308.9 million. The manager is optimistic of maintaining this performance despite a soft property market outlook this year. 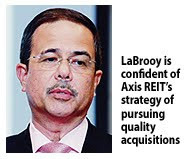 LaBrooy said he is confident of the property trust's growth strategy to actively pursue quality acquisitions. "When we buy, we look for a property with strong yield and possibly a locked-in tenant. We also continuously innovate our existing buildings to attract and retain tenants," he said. Axis REIT is spending RM10 million to refurbish two buildings this year, namely Nestle House, which is now known as Quanttro West, and Crystal Plaza in Petaling Jaya. Nestle Products Sdn Bhd moved out of Nestle House in November last year. The group is spending some RM7 million to upgrade Quanttro and it should be ready by April 2010. "We have anchor tenants for 50 per cent of the space and are currently undergoing talks with another MNC (multinational company) for another 25 per cent of the space. We hope to have the building fully occupied by April," said LaBrooy. KUALA LUMPUR: Axis Real Estate Investment Trust (REIT) plans to acquire three to five properties in 2010 and raise RM113mil this year. Its target was to expand the total assets to at least RM1bil from RM907.7mil as at last month, said Axis REIT Managers Bhd CEO Stewart LaBrooy. Axis REIT Managers is the promoter of Axis REIT. LaBrooy said the acquisition targets included two new logistics warehouses in Johor, a factory or warehouse in Puchong and an office building in Cyberjaya. The acquisitions will total RM180mil. In a briefing yesterday on Axis REIT’s financial performance for last year and its growth prospects, LaBrooy said: “We are positive about our financial results this year despite the soft property market. He said the trust also planned another capital-raising exercise in early 2010.